In Red Dog, number cards count as their face value, Jack is 11, Queen is 12, King is 13 and Ace is 14. The suit is irrelevant. 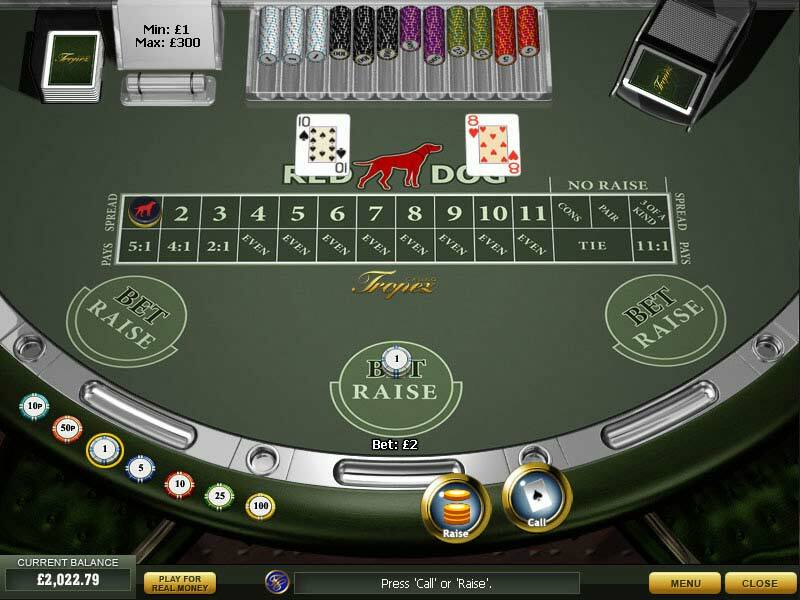 � First, click on the chips to place a bet. To remove chips from the bet, right click on the chips. � Click on the Deal button. � Two cards are drawn. If the cards are consecutive, it is a push (your wager is returned to you and the round is over). If the cards are equal, a third card is drawn. If it matches the first two cards, you win 11 to 1; otherwise it is a push. � If the two cards are neither consecutive nor equal, the spread is established. The spread is the number of card values between the two cards. For example � 2 and 4 have a spread of 1; 6 and a Queen have a spread of 5. � Now you have the option to raise (double) your bet or to call (continue without raising). Press Raise or Call respectively. � A third card is drawn. If it is between the two cards, you win according to the payout table (seen on the card table). If it matches one of the two cards or is outside the spread, you lose. � Click New Game if you wish to play again. Place a bet as described above, or click Rebet to place the same bet again.